Richard Saul Wurman, the author of Information Anxiety, is a trained architect, a very prolific writer, the founder of the TED conference, and a well-known public speaker. Although he wrote this book 30 years ago, the ideas it presents are just as relevant today as they were then, perhaps more so. It’s a credit to the solidity of his thinking that many of his concepts seem to predict the world in which we live today. It’s a credit to the solidity of [Wurman’s] thinking that many of his concepts seem to predict the world in which we live today. He was referring to manual and electric typewriters. I’m not sure where one could buy one these days. However, his descriptions of our relationship to information and its increasing quantity hold up. Information anxiety is the pressure we feel to maintain some level of information awareness in the face of ever-increasing quantities of information. Simply put, information anxiety is the pressure we feel to maintain some level of information awareness in the face of ever-increasing quantities of information. At the same time, the quality of said information is increasingly suspect. 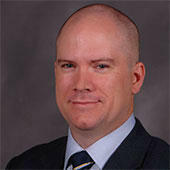 The human appetite for information is insatiable, and there is societal pressure to consume more and more information. We live in a society—in the United States at least—that assumes people have equal access to information, and there is an expectation that people should consume some amount of information. Has someone ever asked you, “Don’t you watch the news?” Or maybe, “Where do you get your news?” I find this frequently happens when a person relates some nugget of news that doesn’t generally comport with known facts or is, more likely, rumor or speculation. But the act of someone’s questioning our level of information awareness is an example of how we create information anxiety. (Interestingly, information awareness is not the same thing as information literacy.) This occurrence—among others such as not keeping up with our email or avoiding appliance purchases out of the fear of poor usability—is symptomatic of our having difficulty dealing with information. I tend to think that information anxiety can explain many of the challenges we face in today’s environment. In a vain attempt to appear information aware, we sacrifice literacy by sharing content after reading only the headlines and failing to think critically about our information diet. The desire to consume and spread information without understanding it is a hallmark of information anxiety, which is caused by an overwhelming deluge of content and low information literacy. Too often, we see our friends rushing to be the first to spread a news story of dubious quality—for example, the recent Momo challenge—only to learn later that it was a hoax. Or we see people acting on information that, while not a simple hoax, may, in fact, be propaganda. The desire to consume and spread information without understanding it is a hallmark of information anxiety, which is caused by an overwhelming deluge of content and low information literacy. While the quantity of information has increased exponentially, the ability of our brains to process information has remained roughly the same. I’ve found that one of the biggest barriers to organizations’ adoption of User Experience is the overestimation of their knowledge base. Wurman notes that people often avoid admitting ignorance, and this ultimately prevents them from learning new things. Similarly, covering up our ignorance leads to a false appearance of knowledge. In Wurman’s words, it is better to accept ignorance and embrace the ability to find knowledge through inquiry. This realization is fundamental to being able to benefit from User Experience. When we do design or research, it is essential that we question our work and make inquiries into the perceptions, biases, and responses our audiences are likely to have. If we presume to know everything about our audience and imagine that we can predict the outcomes of their interactions with our designed tools, we miss out on the opportunity to learn from strategy and design mistakes, to improve, and to innovate. It is better to ask good questions than to have the right answers. Information Anxiety has the most comprehensive and descriptive table of contents I’ve ever seen. Running for 21 pages, it provides a clear roadmap to the contents of the book. While 21 pages for a table of contents may seem excessive for a book that is 356 pages long, it does a very good job of helping one to identify discreet pieces of content that may be of use. Wurman provides several devices for organizing and understanding information. A criticism I have of Wurman is that too many of his insights and frameworks feel contrived or forced. For example, he provides a chapter on maps, making the insightful observation that maps can be incredibly useful for organizing information because everything happens somewhere. But he introduces the chapter with an acronym that feels unnecessary: Man’s Ability to Perceive. Wurman presents a method for categorizing information that he calls the “five ultimate hat racks”—later abbreviated as LATCH for Location, Alphabet, Time, Category, and Continuum, then Hierarchy. This organizational device is helpful, but not revolutionary. As it is presented, it is reminiscent of the facets used in colon classification—Space, Matter, Time, Personality, and Energy—which was developed by S. A. Ranganathan. The book feels like a collection of essays that are generally related to a central idea. There might not be a single through line, so you can read the chapters in any order you like. Like most of Wurman’s writings that I’ve read, the book feels like a collection of essays that are generally related to a central idea. There might not be a single through line, so you can read the chapters in any order you like. Wurman makes extensive use of sidebars, figures, and graphic devices throughout the book to provide examples and evidence supporting his statements. While these tools often helpfully give the reader additional information, they can also—somewhat ironically—lead to greater information anxiety. The reader need not follow a linear path when reading this book; instead, wandering over to a sidebar from which Wurman leads the reader down a tangential path. I don’t think this is poor writing at all. It’s just that the topic is so vast, and Wurman has so much to say. I’ve noted this writing style in a few of his books. It is not unlike his speaking style. His storytelling reveals more along the journey than in a final conclusive statement. Much of the book comprises declarative statements that could reveal an observation or insight and are followed by a series of examples or anecdotes. A favorite is the idea: “You only learn something relative to something you understand.” This statement, like others from Wurman, seem obvious upon reading it, but reaches its full potential only when he adds evidence and examples. One example visualizes what one million looks like. In this way, his work reminds me of Tufte’s writings on the presentation of information. Wurman intends the primary focus of the book to be an analysis of the increasingly overwhelming role of information in our environment…. Information Anxiety was a foundational book for the emerging field of information architecture. While Wurman intends the primary focus of the book to be an analysis of the increasingly overwhelming role of information in our environment—I think it does this well—and the solutions he offers for coping with it, the book really feels like it could be two or three separate, shorter books or a collection of essays. Should you read it? Well, given that it’s out of print that might be difficult. But yes, you should. The author poses a wealth of ideas—and questions—through which he encourages us to consider our information environment critically, as well as our relationship to it. 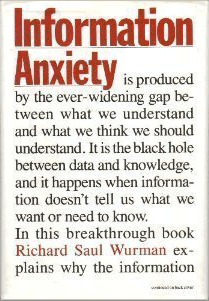 Wurman also provides a generous bibliography, making Information Anxiety a useful guide to gaining more knowledge, in addition to its own contributions.